Prime Minister, Shri Narendra Modi on Sunday inaugurated the Delhi-Faridabad Metro Line that would allow hassle free travel for around two lakh daily commuters between the national capital and the industrial hub in Haryana. 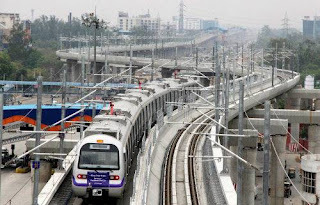 Meanwhile, addressing a press conference in Faridabad on Saturday, Chief Minister Manohar Lal Khattar thanked the Prime Minister for gifting the Metro service which would take the city to another level of progress with better connectivity with other NCR towns. The Prime Minister regretted that it had become a fashion to politicize every decision taken by the Union. He said the whole world had recently faced economic difficulties, but India's economy had stood firm. He added that all State Governments and the Union Government had to move forward shoulder to shoulder. He reiterated his Government's resolve for Housing for All by 2022. The Prime Minister travelled from Central Delhi to Faridabad, and back, by metro. In the course of the journey, he interacted with several people, especially youth, who were also travelling on board the metro train.